FSL Tonight Week 3 – Can Anything Stop Ultron?! Han Solo may be feeling much better but Cheyenne made the Senators look like gods! The Raiders have New York seeing things. Sorry for the Delay, things have been a little hectic on Shecky’s end, but here are the lines for Week 3. FSL Tonight Week 1 – Teamwork? Who needs it? Coruscant sends Tony Stark back to the pit and the Guardians show that teamwork isn’t always necessary. Tom and Justin are back to run down all the off-season moves and deals and estimate the chances of each team including the new arrivals: Cheyenne Mountain Gaters and Los Angeles Guardians of the Galaxy. Hello and welcome to season 5 of FSL. My name is Mitzula, I am the Earth’s Ambassador for Shecky Green’s Intergalactic Sportsbook and Cantina.Last year everyone over at Shecky Green’s Intergalactic Sportsboook & Cantina had a blast being the exclusive betting hub of the FSL and we’re pleased to announce that we have once again secured the rights for season 5. I have been given the opening lines for not only weeks 1 & 2 but also the lines for the overall champion of FSL Season 5. This year I’m hoping to be able to offer some insight into my picks as I too am a big fan of all things FSL. So without any more rambling here are the FSL Season 5 Lines. 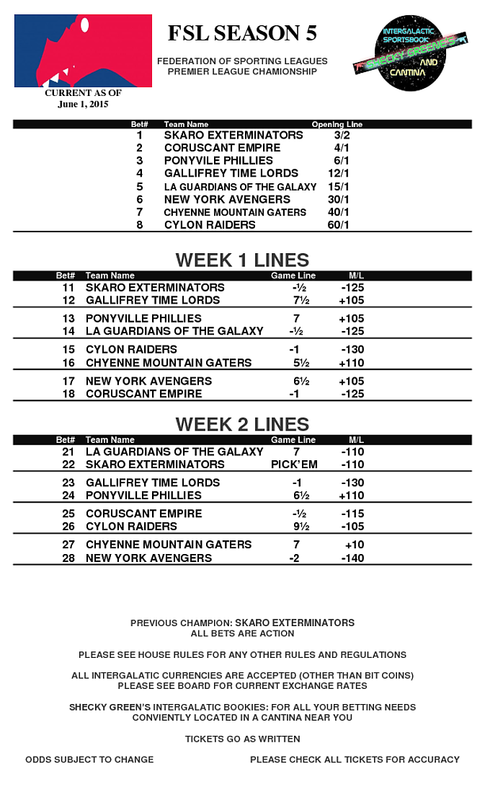 Lines are now open, so head to your local Shecky Green’s Intergalactic Sportsbook and Cantina and get your bets in for this highly anticipated season.